Weathered stain and a textured galvanized roof bring a decorative rustic feel to your birding experience! Made with naturally insect and rot-resistant premium cedar. Air vents allow for maximum air ventilation through wall and floor openings. Clean-out doors provides easy access for cleaning. Predator guard extends entrance hole to protect against predators. Fledgling skerfs provide extra grip for fledglings to climb out. 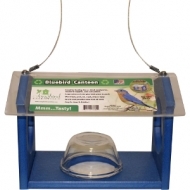 Great for feeding live or dried mealworms, bluebird nuggets, and suet pallets. Large entrance holes give birds places to perch. Won't fade, peel, crack, chip, rot or warp. Acrylic roof provides view from all sides. Easy to clean and disinfect. Festive snowflake design. Squirrel resistant, weight activated cage. All metal, powder coated silver finish. 6 feeding ports with u-shaped perches and 2 pound seed capacity. Lid locking twist and lock. Stainless locking handle and heavy duty. Beautifully decorated with a wire mesh body. 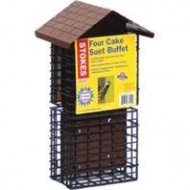 Holds 1 standard sized suet or seed cake. 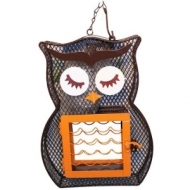 Durable metal chain and hook for easy display. Beautifully decorated with a wire mesh body. 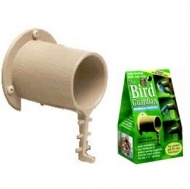 Holds 5 cups of bird seed. 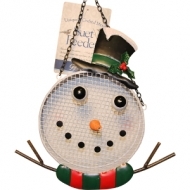 Durable metal chain and hook for easy display. Highly-palatable, easy-to-use 20-pound premium block supplement for attracting and maintaining pheasant, quail and other game birds. 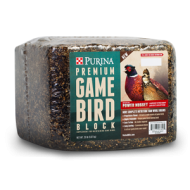 Now containing the new Purina® Power Nugget™ supplement, new Purina® Premium Game Bird Block provides more complete nutrition for game birds than whole grains. Use to Feed: Dried Mealworms or Traditional Seed. Adjustable & Locking Roof with Powder Coated Metal Mesh Bowl. 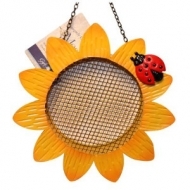 Hold sunflower seeds or peanuts, along with 2 standard-sized suet cakes or small seed cakes. Full-surface feeding area and twist-lock top opens for refilling. Squirrel proof. 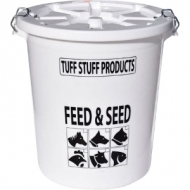 Holds 3/4 quarts of seed and easy to fill. 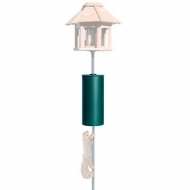 Weight adjustable to help control unwanted birds. Chew proof. 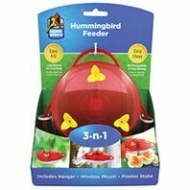 One Feeder, Three Ways: Hanging Feeder, Window Feeder, Or Planter Feeder. Includes Hanger, Window Mount and Planter Stake. Large Opening For Easy Filling. Base Disassembles For Easy Cleaning. Bring More Birds and More Joy To Your Yard. 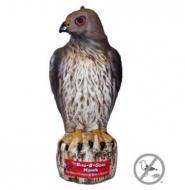 The Hawk decoy is ideal for protecting open outdoor spaces such as backyards and gardens and is the first Hawk decoy available for deterring birds. Because Hawks hunt during the day, they are more recognizable as a predator than owls decoys. Visual deterrents appeal to a bird's sight and sense of danger. Red Tailed Hawks are known for hunting during the day, while most owl species hunt at night when birds are roosting. This makes the hawk a more identifiable predator, when birds see the decoy; they will want to avoid the area! 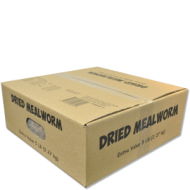 Bulk Dried Mealworms in a convenient box for storage. Holds Up To 5Lbs Of Mixed Seed. 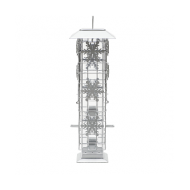 Made Of Heavy Duty Steel with a Rust Resistant High Quality Powder-Coated Finish. 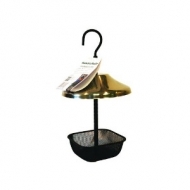 Continuous Metal Perch Offers Generous Feeding Space For Birds. Coated Steel Cable. Made In The Usa. 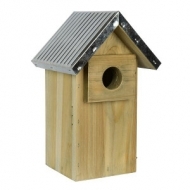 Durable Cedar Construction and Assembled With Rust Resistant Screws. Single Screw Cleanout Panel. 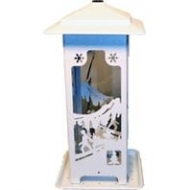 This Quality Feeder Holds 4 Suet Cakes and Has Ample Space For Multiple Clinging Birds To Feed At Once. The Roof Design Helps To Protect The Suet From Rain and Snow. 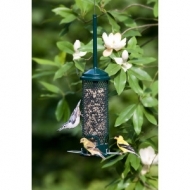 The Metalwork and Construction Of This Feeder Are Top-Of-The-Line. 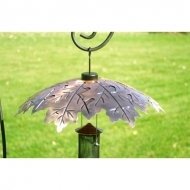 This 18" Brushed Copper Weather Shield hangs over your feeders to keep your feathered friends dry. 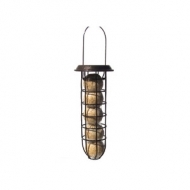 Designed for Wildlife Sciences Suet Balls. Fun Addition to Backyard Suet Feeding. Sturdy and Long Lasting. Antique Copper Roof and Coated Black Wire. 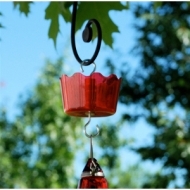 Holds up to 5 Suet Balls. 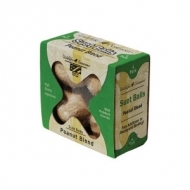 4 Pack Peanut Blend Suet Balls. Superior Melt-Resistant Formula. 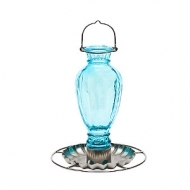 Traditional vase style glass bottle. Blue with luster finish. Wide mouth opening for easy filling and cleaning. Unique circular perch design. 18 oz water capacity. Ant Off Ant Guard is used to keep hummingbird feeders free from ants and pests. Everybody loves a good tea party! The birds will especially love this one! 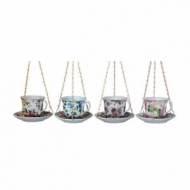 Simply hang this dainty tea cup bird feeder and watch as the birds indulge! 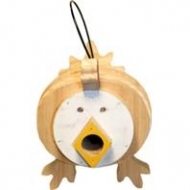 The Original Bird Guardian protects eggs, baby birds and even the adult bird in the birdhouse from harm.